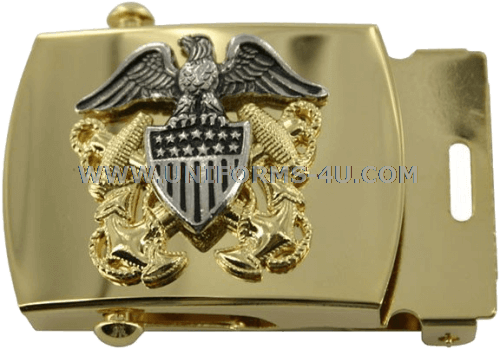 Designed to meet United States Navy uniform and insignia regulations, our Navy Officer’s belt buckle features a pair of diagonally crossed gold, fouled anchors supporting a silver shield which is surmounted by a silver eagle facing to the wearer’s right with outstretched wings. 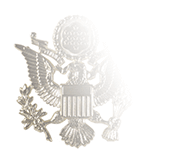 The high relief version offers a sharper contrast between the burnished silver shield and its stars and stripes, while the shiny provides a more lustrous appearance. 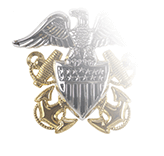 Male buckles are designed to accommodate the 1.25” width of the Navy’s men web belts, while women’s belts are an inch in width. 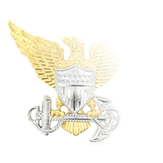 The Navy also has different rules regarding the wear of buckles by male and female officers, with men wearing the buckle so that the end with the belt clip touches the left side of the buckle, while females wear the belt clip end so it touches the right side of the buckle (exceptions are made for the Navy Working Uniform and Coveralls). For unisex uniforms, the belt clip is worn to the left of the buckle. 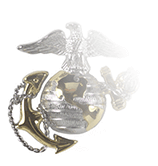 Please note that the 3-inch version is longer than the standard Navy buckle and its wear might require authorization; it is worn centered with the clip end concealed. 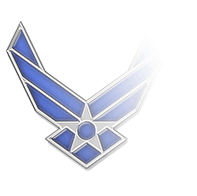 This buckle is also authorized for wear by Chief Warrant Officers CWO2 to CWO5.